The third place of the Volkswagen Up! is threatened by the all-new Renault Twingo, which manages to improve 44% vs. a 12% drop in sales for the small VW. The Twingo enjoyed an especially successful month of February, moving into third place for that month. However in March, the third place of the segment was taken by the Hyundai i10, which wasn’t enough for the small South-Korean minicar to fend off the surging Toyota Aygo with sales up 30% thanks to the new generation. The Aygo takes a clear early advantage over its clones Peugeot 108 and Citroën C1, as its first generation did in 2006 and 2007 before the two French contenders upped their game and moved in closer. Funnily enough, total sales of the three first generation Kolin sister models are within 1,5% of each other, so perhaps the 108 and C1 will catch up later again. The Opel/Vauxhall Adam keeps improving after its less than impressive start and has now surpassed the Ford Ka and Smart Fortwo to move within 51 units of a top-10 position. The latter is down 21% despite its still-fresh third generation, but that’s clearly because of cannibalization of the all-new four-door Smart Forfour. 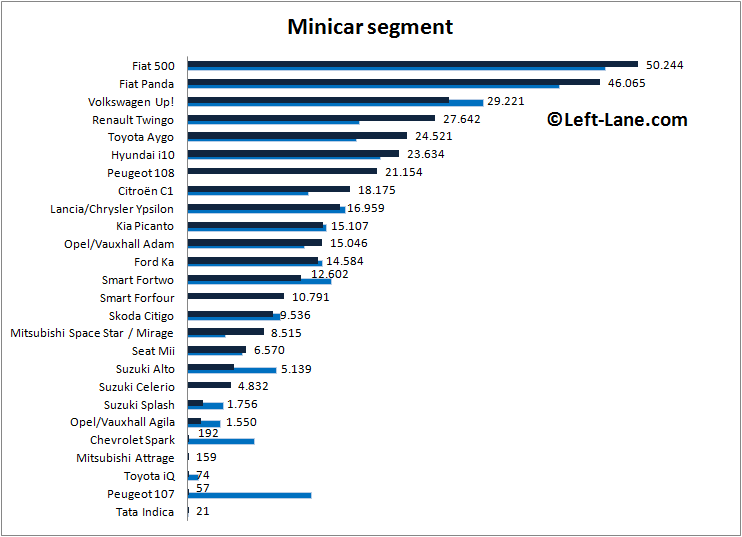 Together, the two minicars score the Smart brand’s best first quarter in at least five years. The Mitsubishi Space Star continues its impressive late-career improvement, moving in between the Skoda Citigo and Seat Mii, while the Suzuki Celerio is unable to outsell its outgoing predecessor Alto. To be fair, the Alto is only able to hold its successor off thanks to selling 1.575 units in February in The Netherlands alone, out of a total of 2.268 in that month vs. 979 for the Celerio. However, those 1.575 “sales” in The Netherlands are probably not yet sold, only registered to benefit last-minute of a tax-break that ended in March. The Dutch dealers will now be selling off pre-registered previous generation Suzuki’s at rock-bottom prices for a few months, undoubtedly harming sales of the Celerio in that market. Besides the Peugeot 108 as a replacement to the 107 and the all-new Smart Forfour, we welcome another newcomer to the segment this year: the Mitsubishi Attrage, a sedan version of the Space Star, which is developed for emerging markets mostly in South-East Asia, but will also be imported into a limited number of European countries, most notably in the south, where sedan models still enjoy some popularity. Regarding Smart 4/2 sales, don’t forget that for the first quarter it was also only available with a manual gearshift, which probably put a lot of traditional Smart customers off. Hi Tuga, good point. One would think that a manual would actually broaden the potential for the model, as not everyone was a big fan of the sequential automatic in the first two generations. But you’re right about the loyal Fortwo buyers who may consider it part of the DNA of the brand. It’ll be interesting to see for the rest of the year. But if the Forfour ends up outselling the Fortwo, indicating most customers are indeed willing to pay a little more for a 4-door 4-seater while losing the advantages of the small size (p.e. parking sideways), then that might prove the Fortwo pointless and redundant, and could potentially bring Daimler to the point of killing the model in favor of the Forfour. On the other hand, that would be admitting failure on a project that’s cost them hundreds of millions…..